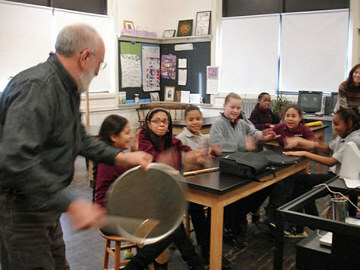 UPP facilitated a series of workshops on designing, creating and playing meaningful percussive instruments as part of Science teacher Alyssa Wood and social studies teacher Tatiana Cozzarelli's 5th and 6th grade units on Native American history & culture and social & environmental movements. 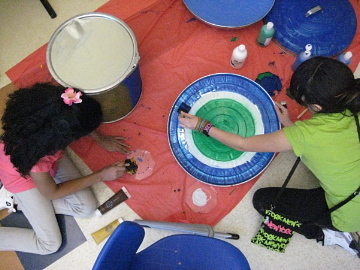 Artists Holly Ewald and Priscilla Carrion helped students make and decorate instruments out of natural and recycled materials while musicians Phil Edmonds and Paul Scharf helped build students' music-making repertoire with rhythm exercises, enhancing their musical, listening and cooperation skills through participation in drumming circles. 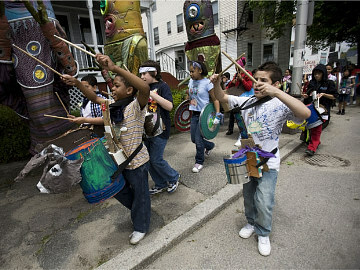 Sophia students then played their instruments through the streets during the 2011 Procession. 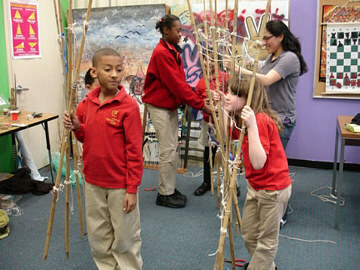 Artists Holly Ewald and Priscilla Carrion worked with the after school Green Club and art students to create a public art fence out of natural and found materials, inspired by the resourcefulness of Native American practices and other examples of public art. Students learned about the effects of storm drain runoff and soil and groundwater pollution at the Gorham site with interactive models designed by Will York, Founder of smallFeat. The Green Club constructed the fence structure and the 3rd grade art class finished weaving the fence in time for the procession. 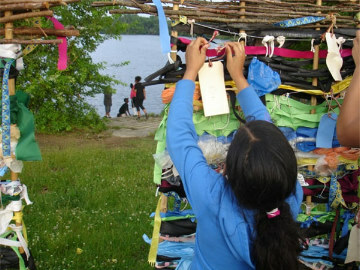 After its debut in the Procession, the 3 part fence (approximately 9' X 4' in total) was placed at the JT Owens Park boat landing through the end of August, during which time visitors were able to learn about the environmental and health reasons the public should not enter the water from an information box attached to the fence. They were also able to write their wishes for the pond on provided luggage tags and tie them to the fence to spur public conversation. Kris Lee and Lisa Melmed of Providence ¡CityArts! 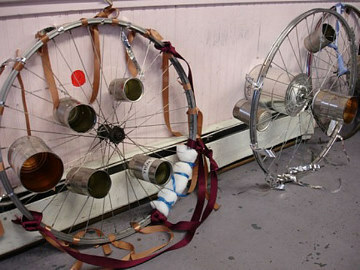 for Youth worked with students in their PASA after school class,Build UPP the Beat, to learn about Mashapaug Pond, create beats and design homemade percussion instruments. The Nathan Bishop brigade came in full force to the May Procession and engaged the Extraordinary Rendition Band in a memorable exchange of percussive prowess behind Liberty Elm Diner.